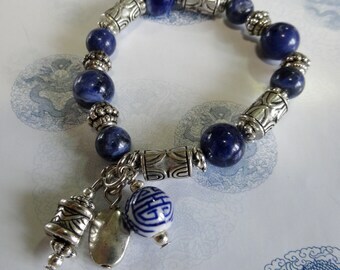 Jewelry with an oriental flair. 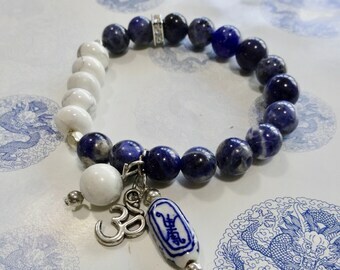 Announcement Blue White Wear creates jewelry (necklaces, bracelets, earrings) with an oriental touch! A modern version of East meets West. Most of my pieces are one of a kind. Thanks for stopping by. Please return often as I add new jewelry regularly. 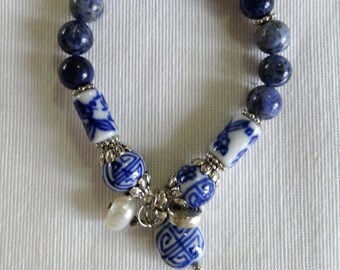 Blue White Wear creates jewelry (necklaces, bracelets, earrings) with an oriental touch! A modern version of East meets West. Most of my pieces are one of a kind. A very well made necklace. Highly recommend. This lovely necklace is even more beautiful in person. Light dances off all the facets and the colors are gorgeous. I'm very happy with it! I love my new bracelet, in particular the fun charms! I am a proud owner of many of Claire's creations. They are all beautiful, unique, and well crafted. I look forward to adding to my collection soon! Hello! Welcome to my little shop. If you are looking for unique necklaces and bracelets with a touch of the orient, this is the place! Returns/Refunds: Please notify me within three days of receiving your item(s). I will exchange or refund your money as soon as the item is returned and received. Shipping and handling costs are the buyer's responsibility. I accept Paypal. As soon as your payment is received, the item will be shipped within 1 to 3 days. Shipping: Registered International airmail: Shipments may take anywhere from 7 to 21 days. Most items cost $3.00 to $6.00 to mail. I am happy to combine items for shipping. Privacy: Your personal information will not be shared, rented, or sold.